There's a discussion in the comments to this thread about the Soloveitchik-Twersky Rabad thing. Someone opined that the Soloveitchik review revealed some bad blood, a grudge or a feud, since it's otherwise difficult to see why S. would choose to write a review (and a harsh one at that) of his brother-in-law T.'s book, thirty five years after it had been published. Similarly, R. JJ Schacter must have had some sort of a grudge against R. Leo Jung, whose pulpit he filled, since he co-wrote a lengthy article called "The 93 Beth Jacob Girls of Cracow: History or Typology?," ( Reverence, Righteousness, and Rahamanut: Essays in Memory of Rabbi Dr. Leo Jung, New York: Jason Aronson, 1992, pp. 93-130). The story of the "93 Beth Jacob Girls of Cracow," is that 93 Beis Yaakov students and teachers killed themselves, rather than be forced into Nazi brothel. It is based on a letter written by one of the girls, Chaje Feldman. The incident was apparently first publicized in America during WWII by R. Jung himself. R. Schacter makes the case that this specific event did not occur. In other words, the contention is that the story or legend of the 93 girls is highly associated with R. Jung. Thus, debunking the legend has to mean something deeper, some enmity. R. Schacter edited this volume in memory of R. Jung, and frankly, I think it's crazy to accuse him of harboring some sort of grudge against R Jung, who he seems to have had a great deal of affection and admiration for. Here is a very interesting excerpt from the introduction of R. Eliyahu Bahur's1 (Elijah Levita 1469-1549) Hebrew lexicon Tishbi. This work was published in Isny, Germany by the Christian printer Paul Fagius. It features Hebrew words that require clarification, such as words stemming from foreign languages, and words that were not defined in earlier lexicons like the Aruch of R. Nathan ben Yechiel of Rome. As you can see, he effusively praises Fagius, with whom he developed a close relationship. "The truth is it would be fitting for his people (e.g., Christians) to say of him what we say about Maimonides--'From Moses to Moses, there has been none like Moses--they should say about him 'From Paul to Paul, there has been none like Paul.'" Upon coming here I examined his barrel and found it full of old wine. I hadn't been told of even half his wisdom and knowledge. Many draw from the wells of his instruction, he teaches good to his people. He expounds and interprets nicely. The truth is it would be fitting for his people (e.g., Christians) to say of him what we say about Maimonides--'From Moses to Moses, there has been none like Moses--they should say about him 'From Paul to Paul, there has been none like Paul. When he saw this book that I'd written, and recognized its great worth and utility, he hastened to translate it into Latin, which our ancestors called Leshon Romi (e.g., 'Roman'), and he put the two languages together, facing pages, and he didn't add or omit. We agreed to print them together, and we will put our concentration and great efforts into it, he from one side, and me from another. And each of us calls to our God that we might succeed in our work. 1 I posted about Elias Levita (רבי אליה' הבחור אשכנזי) here. 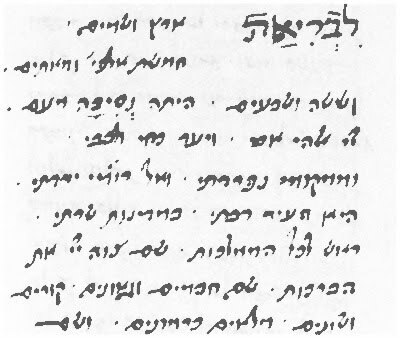 This note appears at the beginning of the haskama (rabbinic approbation) section of some volumes of their Schottenstein Talmud translation (this is from Babba Metziah). As you can see, Artscroll quotes R. Eliashiv saying that "Because of the times we live in it is a great mitzvah to proceed with this project." Indeed, from the verbatim Hebrew text of his message, which he requested be inserted, the last five words say this. But that's five words out of thirty three. What do the other 85% of the words mean? Well, if you can understand Hebrew, you know. So there is it. But what if you can't? I find this interesting because it seems to sort of typify the approach one sometimes finds in Artscroll publications. The Hebrew text is the Hebrew text; they aren't going to tamper with the text. It's there for you to see, and very literally, המבין יבין. But much of the audience of these publications cannot understand much Hebrew, or any, and in that case abridgments must suffice. Before I translate the words (noting that most of this audience doesn't need the translation and already sees what I'm getting at) I'd like to point out that Artscroll doesn't translate any of the haskamos that appear in these books. While it certainly would be useful if they did, it doesn't seem like any sort of big deal that they don't. It seems like this is common practice in English books that are accompanied by Hebrew haskamos. Surely sometimes haskamos are not as unqualified or praising as one would like, and therefore authors and publishers often would like readers to look at the names rather than the content of the approbations, and that's true across the board. So nothing funny here, or at least nothing funnier than usual. What's interesting is that while R. Elyashiv does commend the work (Talmud translation)--"because of the times we live in it is a great mitzvah to proceed with this project"--he also explains what sort of times he is referring to. "Since we live in a breached generation with many translations by lightweights who put their hands on the holiness of the Talmud and the Oral Law, I think there is no es la'asos le-Hashem1 greater than this, and it's a great mitzvah to proceed with this project." All in all, most interesting. As I said, it's right there, black on gray. Obviously a sizable portion of the buying public knows exactly what it said. But many don't, and won't. It's understandable why they don't translate large haskamos (R. Aharon Schechter, rosh yeshiva Yeshivas Chaim Berlin wrote a particularly long one, for example). But this is less than 35 words. I suppose that the editors didn't necessarily want to make a big deal about the fact that R. Elyashiv gave what amounts to very qualified support for their work. No big deal, but interesting, and the wise will understand. קכו עֵת לַעֲשׂוֹת לַיקוָק הֵפֵרוּ תּוֹרָתֶךָ 126 It is time for the LORD to work; they have made void Thy law. Rabbinically this verse is given as justification for--at times--'making void Thy law,' that is, to violate halakhah because "It is time" to do the Lord's work, that is, to repair a breach, to safeguard the Torah, sometimes the time gives no other choice than to breach it. In this case, R. Elyashiv is asserting that in this time a translations of the Talmud [like Artscroll's]--which normally, in other times, is undesirable at best, if not forbidden--is necessary and a great mitzvah. What, however, was the nature of Hoffmann's scholarship in his other major field of academic study, rabbinics, which Hirsch had labeled "heretical"? In examining this area of Hoffmann's academic work, it is clear that some of the same patterns evident in his biblical studies are present here, too. In nearly all of his works, the same, seemingly obligatory statements about the nature of authentic Jewish faith are found. In his rabbinic investigations, in contrast to his biblical studies, however, Hoffmann appears to be more of the contemporary academic. Throughout his works he cites the scholarship of Rappoport, Frankel, Geiger, and Graetz, sometimes approvingly, sometimes disapprovingly--but never, it seems, tendentiously. In this way, Hoffmann becomes one among several academic scholars involved in a community of research. In addition, Hoffmann often employs an approach to the field of rabbinic history which marks him as a practitioner of Religions-Wissenschaft in the broadest cultural sense, an approach that allowed him to consider the ways in which the surrounding culture of the ancient Near East may have influenced rabbinic civilization, something he would never have considered doing in his biblical studies. 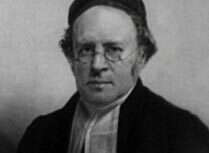 For example, in his Mar Samuel, Hoffmann points out that the rabbis were identified as Hachamim, "Weise." Then, in a footnote, he states, "One also designated the Savants of other peoples with the selfsame title." It was remarks such as this, along with his citation of "heretics" such as Graetz and Frankel, which undoubtedly aroused the ire of Orthodox colleagues like Hirsch and caused them to view at least this work of Hoffmann as kefirah, heresy. Hoffmann's writings on the evolution of the literary structures, forms, terminology, and modes of interpretation in both midrash and Mishnah would seemingly be even more dangerous to the foundations of Orthodox Jewish faith. Yet there is no question that Hoffmann did investigate these texts in a manner that makes it difficult to distinguish him from Frankel, Geiger, or other scholars of rabbinic literature. This does not mean that Hoffmann agreed with them either on particular points or specific theories. But Hoffmann was clearly involved in discourse with these men. Like Frankel Darkhe HaMishnah, Hoffmann First Mishna reveals that he saw development and variety in the different strata of mishnaic literature. His notion that there was a "First Mishna" before the destruction of the Second Temple and that there were disagreements among the later tannaim as to its form; his efforts to reconstruct and discover that form; his willingness to investigate the disparate strata which undergirded that form; as well as his work on the halakhic midrashim, all combine to reveal the seminal nature of his studies in the academic area of rabbinics. Proactive as opposed to reactive, his scholarship in this area is clearly distinct from his efforts in the discipline of Bible. * I mean not relating to halakhah, rather than against halakhah! 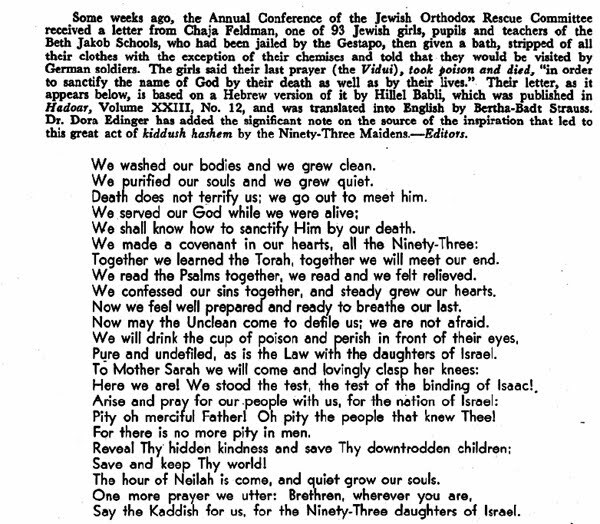 Regarding the aborted Pinner Talmud of the 19th century, I came across a prospectus, translated into English, published in an 1835 edition of R. Morris Raphall's Hebrew Review and Magazine of Rabbinical Literature. "If the obscurantists are not yet shaking in their feet, once they see our ever-forthcoming translation of the Arukh ha-Shulhan, which will bring back the 1950’s and the “mimetic tradition”, this will put them in their place." "For a while I thought that I could impress those ever-impressionable Shabbat guests by pointing out that contrary to what the Arscroll siddur, p. 807, states, R. Eleazar Kalir was not a tanna. But again, this is not something that most people care about. Besides, someone always ended up pointing out that no less than Tosafot claims that he was a tanna, and my protestations about what Shir proved were always met with blank stares, for what does a Prague song have to do with anything?" Good post with a hilarious introduction by Marc Shapiro, at Seforim. * Not that I'm a Modern Orthodox intellectual.